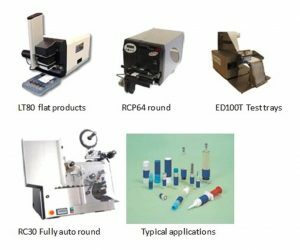 Sessions UK regularly supply benchtop labelling machinery to the Pharmaceutical and Diagnostic industry. These compact stainless steel machines are ideal for lab or clinical manufacturing cells to apply pre-printed labels to round of flat containers from Microtiter trays to small glass vials, using a series of specially designed jigs. Simple to set up with easy label change, label application time is decreased considerably giving maximum output of batch run products. Fully auto machines are also available for larger batch runs.